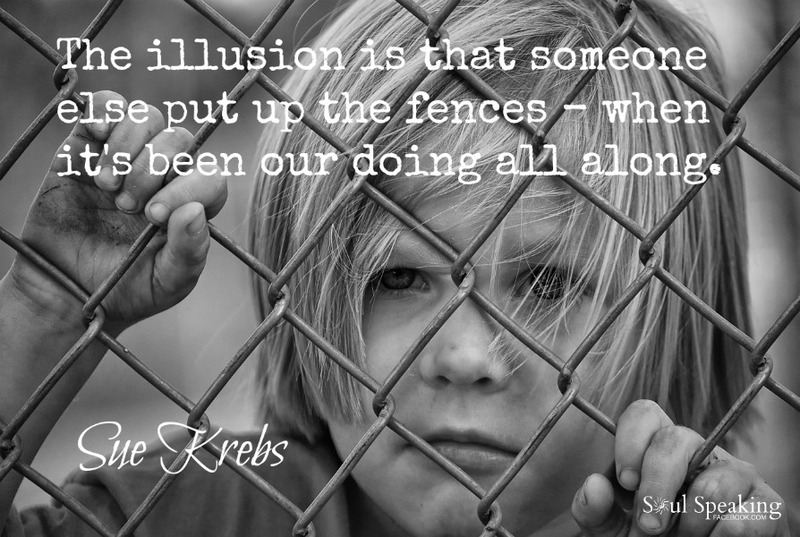 The illusion is that someone else put up the fences – when it’s been our doing all along. We want to hold someone else responsible for the fences we run into. We want to blame them for putting up these barriers – when in reality, any barriers we encounter are always of our own making. I know that is a hard pill to swallow. “How can that possibly be? Why would I put up fences to hold me back? So-and-so is the one that made me mad or is being a jerk or …” or whatever story we tell that shifts the focus from our own thoughts and beliefs that are really responsible for creating the feeling state that we’re in. And try as we might, that responsibility falls squarely on us. I understand. I get it. Life happens. Things break. Kids make poor choices. People act crabby or get depressed. We have disappointments. But in ALL of these things, it is up to us alone to CHOOSE how to respond, how to feel and then how to act. We can let our inner dialogue convince us that we’re powerless, that someone else is at fault – which again just puts us in that victim stance of powerlessness – or we can recognize our power to pause that inner conversation and shift it. I’m not saying this is easily done. Hardly! There are so few role models for this. It is certainly NOT what most of us have been taught. We have no idea what this looks like – but THAT is no excuse for not making the effort, for not choosing to stop self-defeating self-talk, for not interrupting the “automatic” knee-jerk reactions we’re used to employing by default. Pause. Breathe. Ask yourself, “What is appropriate for me right now?” Or “What good in this situation am I not seeing?” It’s solely up to us to change these patterns which no longer serve us. And sometimes… it’s best to just lay low, curl up with a book, and wait for another day to try again. Whatever you choose, own it. Be okay with it. Know that somehow all of this is leading to a better tomorrow – once we quit banging against those fences that we think are holding us back.